Ravenweb features books reviews and posts about popular culture, technology, and writing. 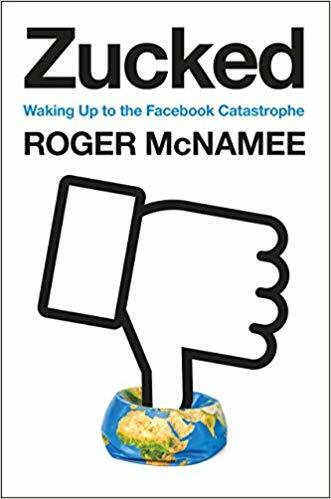 Zucked is a sobering and important book for the stand it takes in calling out Facebook and major Internet platforms in how they are addictive by design, are eroding our privacy, and are susceptible to manipulation by bad actors threatening democracy. I especially appreciated the coverage of filter and preference bubbles and the explanation of how and why modern online platforms can contribute to self-perpetuating beliefs and tribalism. The author read widely about the subjects covered in the book and included a rich bibliography for further reading. Even if you don't read Zucked itself, I've included below some of the organizations, peoples, and books mentioned so you can explore. By coincidence or not, just one month after its release, Facebook founder Mark Zuckerberg published a lengthy blog detailing how Facebook will shift to become more of a privacy-focused communications platform. Common Sense Media - Non-profit organization that provides education and advocacy to families to promote safe technology and media for children. New Knowledge - Information integrity company protecting brands and industries from manipulative online campaigns. It's been over a year since I wrote this, and lot of people continue to find this page from Google, which leads me to believe that people are still having problems with their HP Photosmart C4380s. For the record, over a year later the workaround I detailed here is still working for me. If you have something to add that might help others, please feel free to add to the comments. The original post follows below. So, we bought a wireless printer. After some initial back and forth, we settled on a wireless HP Photosmart C4380. I thought we did a fair bit of research before purchasing the product, but apparently not enough, as there were many issues and surprises that we discovered only after we setup the device. Today is Read Across America Day, and to celebrate the day I wanted to share what I'm reading now and recently finished. And, of course, Happy Birthday, Dr. Seuss! Extreme Ownership is written by two former Navy SEALs and conveys leadership principles from battlefield experiences. This is a reread for me. For those unfamiliar, the book is Viktor Frankl’s memoir of life in Nazi concentration camps and focuses on how though we can't avoid suffering, we always have a choice in how we react to it. This was a useful and readable primer on understanding and reading nonverbal body language by a former FBI counterintelligence officer.